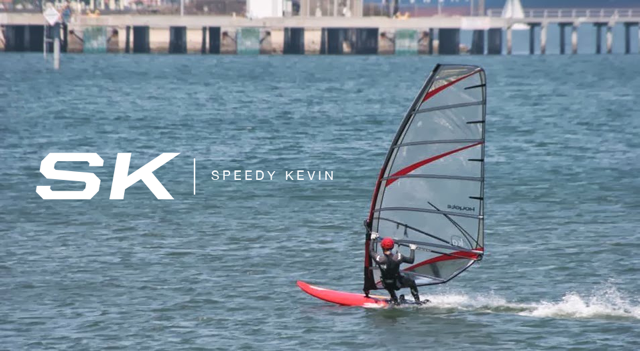 Speedy Kevin: What A Weekend! Man oh man what a weekend it was! The wind was actually there unlike the past week where we had to rely heavily on the puffs. I wasn't even planning consistently on my 7.4 this whole past week. I would say on both days the wind was going from anywhere between 14-20mph with maybe gusts slightly a little higher. Saturday the wind came a bit later around 4 but I wasn't really able to take advantage of it as Jack and I had rigged early and had at least 2 hours of sailing in mediocre conditions before it picked up. By that time we were getting fatigued and decided to call it a day and prepare for the potluck with the rest of the inside guys. I was about to start the irreversible process of derigging when Jack showed me his max speed for the day: 26 knots. I never really tried to do any runs prior to that as I was busy trying to "race" folks on a beam reach. I only ended up getting 25.9 knots :(. BUT I decided I couldn't allow Jack, teammate or not, to continue to have that smirk on his face so I went out and did a few runs. The wind started to die down but I managed a 29.4 knot run with a 28.79 knot 10 sec run. Good enough for me! As they say teammates are supposed to push each other to achieve more and that's what happened! After that we had our potluck with the insider sailors. Macro brought his famous Argentinian sausages and damn was that good! Nothing is more fun than sailing and enjoying a meal with good company! On a side note, there is a bunch of new sailors now on the inside! If I can remember correctly, welcome to the Cabrillo Windsurfing Family Brian, Carlo, and Ryan! Hopefully you guys can all join us at our next pot luck! Sunday was similar to Saturday but the wind picked up a lot earlier. I was very well powered up on my 7.4/95L combo and spent most of my time and effort on speed runs. 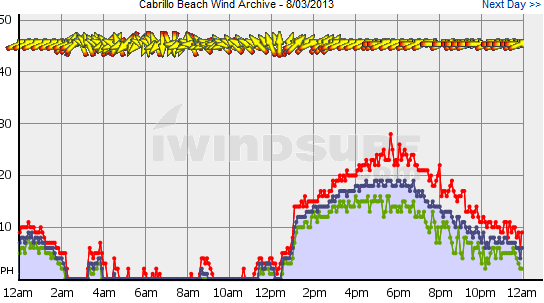 I managed to set a personal best for the inside of Cabrillo at a 5x10 average of 26.92 knots. What I'm really happy about is that my 10sec runs are getting closer to my 2 sec peaks IE. 10sec run: 28.79 knots 2sec peak:29 knots. While not the highest numbers I've clocked, I feel that these are pretty darn good considering the gusty lull conditions of the inside. A thing to note was my 2 VMaxs (31 and 35) arrived. First impressions felt like I was going slower with them on my 95L AHD SL1 than compared to my SL7. Alas, the GPS proved I was actually going faster thankfully. Like the saying goes, if you feel like you are going fast you are probably not haha! What I really like about the VMax's is that they don't have the drag feel that the SL7 does. While the SL7 is a powerful fin, it seems to have a draggy feeling at higher speeds. Also the VMax definitely does deep downwind runs (>110) a whole lot better thanks to the rake. All in all very pleased with it's performance. Can't wait to use the 31 with my 6.6 on the right day! Back to Sunday's session, I was supposed to get out of the water by 4:30pm but a racer from the outside came in and I couldn't help resist the urge to "race" him. With that being said I was very pleased with the SL1 + Koyote + Vmax combo. Sadly though, I didn't get out of the water till 5pm...nearly made it late to boyfriend duty...some symphony Vivian wanted to attend... Alright it wasn't any symphony, it was the Pacific Symphony. Made it just in time though and had fun at the Verizon Amphitheater! Definitely loved the cookies they gave us at the event :D OH and the music was good too! Well today will be my last say sailing at Cabrillo for 2 weeks. I'll be flying out to Dominican Republic on the 7th so hopefully there is still some wind down there. Looks like I'll be needing an 8.4 down there... oh well at least the beaches are nice! Hope to see some of you at the beach today but if not I'll see you guys when I get back. PS: Forgot to say Jack will be trying out a 8.5 KA Koncept. It took me quite sometime to get it to fit in my car with a 7.4!